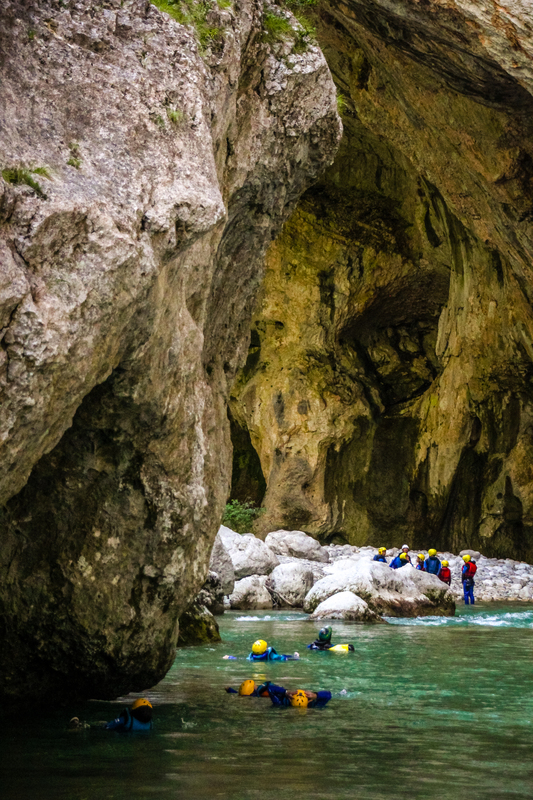 Water hiking is a hike in the water where you can discover the inaccessible parts of the Verdon while walking, swimming, jumping and bypassing all the obstacles by sliding on natural slides. A guide will show you how to move and explore the best river. It is an pleasant activity accessible for all. The following items will be at your disposal: lifejacket, helmet, neoprene wetsuit, neoprene jacket or windproof jacket and neoprene socks dependant on the season. The service includes: supervision by a qualified guide, all safety equipment which conforms to European standards, individual equipment, return transportation to the departure point and company liability insurance. Previous experience is not necessary however you must be able to swim, be a minimum of 8 years of age (minors accompanied by an adult) and bring with you a swimsuit, a towel and a bag. Sport shoes must be worn however they may go in the water. THE WATER HIKING IS FEASIBLE EVERYDAY EXCEPT ON THE DAYS WHEN THERE IS INSUFFICIENT WATER. THE RATE OF THE WATER IN THE VERDON IS REGULATED BY THE EDF DAM (Chaudane/Castillon). THEREFORE THERE MAY BE CHANGES TO YOUR RESERVATION.